I have a new love: buckwheat flour. For several months I have been eying the packet in the supermarket, not quite knowing what to do with it and how it would behave in cooking and baking, not knowing what the taste would be like. On top of that, it is very expensive here in Dubai. A few yummy looking recipes at Healthy Foodie and Healthful Pursuit finally convinced me to give it a try. And what can I say: I have been baking and baking and baking. Mainly these muffins, but also crackers, and some other ideas are lined up. The reason I have always been eying buckwheat flour is because it has a low glycemic index AND it is gluten free. Usually it's one OR the other. I have just spent a month in Germany where breads and wheat flour are part of at least two out of three meals. Upon my return I wanted to get back to my normal self by going gluten free for some time. My buckwheat flour discovery was perfectly timed. My family is gobbling up both muffins and crackers. I haven't even told them what's in there. They don't care anyway, as long as it tastes good. 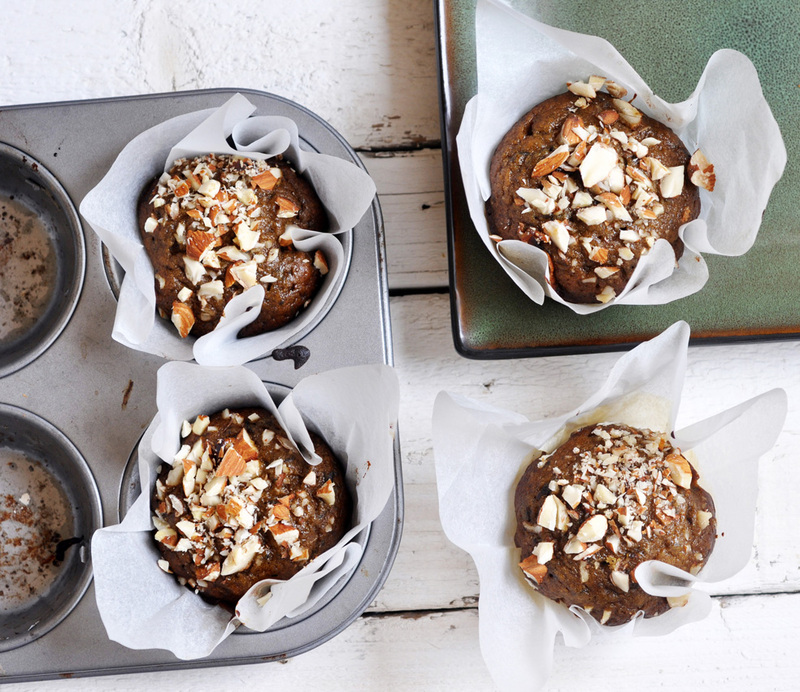 On top, these muffins are sweetened with dates only. The nuts on top can be exchanged or omitted. If I want to get all fancy about these muffins, I'd throw in some dried cherries or apricots. Place chopped dates, milk and baking soda in a small pot. Bring to boil, then let simmer for another couple of minutes. Take off the heat. Let cool a little. Then blend to a paste in a food processor. Beat the eggs. Whisk in vanilla and olive oil. Stir in the date paste until well combined. Finally add buckwheat flour and mix until just combined. Transfer batter to prepared muffin tin. Top each with some chopped almonds. Bake for 25 minutes, or until cake tester comes out clean. Let cool completely on wire rack.